While I was visiting the glades near Calico Rock, Arkansas this past June, I went into town to look along the White River. With the amount of sandstone bedrock in the area, I thought there I might find sandy loam deposits along the river of the type preferred by Cylindera cursitans (ant-like tiger beetle). While I didn’t find any of the beetles, I did see this robber fly (managing only this single shot before it flew off), which I take to be the male of Triorla interrupta based on the pattern of abdominal coloration (the first two segments partially black, followed by two almost wholly black segments). According to BugGuide, this is the only North American species of the genus (a second occurring from Panama to Argentina), and Herschel Raney considers it to be the most common robber fly in Arkansas. This entry was posted in Asilidae, Diptera and tagged Arkansas, entomology, flies, insects, nature, robber flies, science. Bookmark the permalink. Well you certainly nailed the one shot it gave you! Very nice! Thanks, Morgan. I was trying to get a little more of a frontal shot, but this one actually turned out to be good because of how clearly it shows the diagnostic abdominal markings. 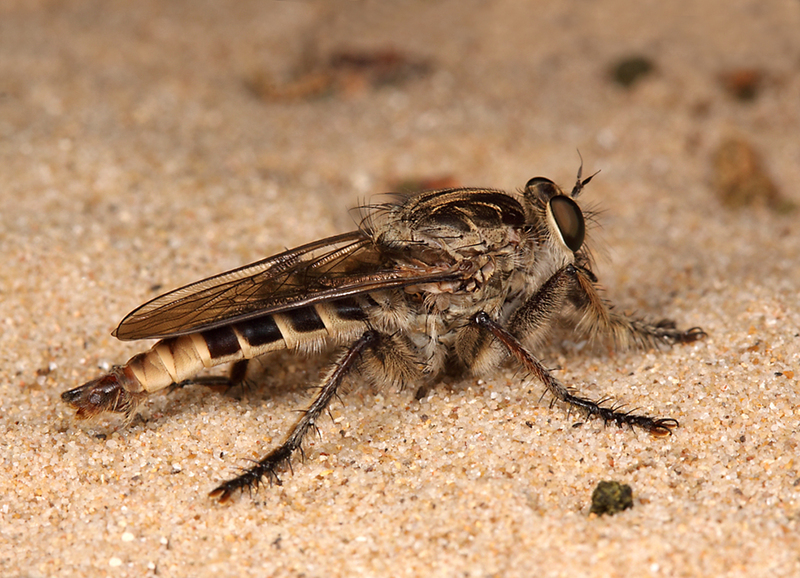 Yes, a very clear and detailed picture of a robber fly. Well done, especially since you had only one shot at it. Thank you Steve. You have some marvelous photographs at your site as well. Thanks. I even have a photograph from five years ago of a robber fly “embracing” a skipper butterfly that it caught, but I haven’t posted that picture yet. Maybe someday.